Are you ready to tackle beginner trails in Bali on a dirt bike? Ride along Tabanan Beach and learn how to operate your bike in greater detail – the perfect dirt bike beginner trail in Bali already awaits you! The Learn-To-Ride dirt bike Bali package is perfectly suited for beginners who have never been on a motorbike before. There is no drivers‘ license necessary! Our experienced team will give you a detailed introduction and dirt bike training. Motocross training shows you how to work your machine before getting ready for the ultimate dirt bike beginner adventure. After the motocross beginner training session you will be able to ride your bike along Tabanan Beach. Feel the adrenaline pumping and get familiar with the motorbike! If you are ready, and there is enough time, we will guide you around Bali’s beautiful rice paddies located nearby. The whole adventure takes 2 ½ hours. If you get addicted to this fun adventure, we suggest one of our beach or jungle trips for another day! 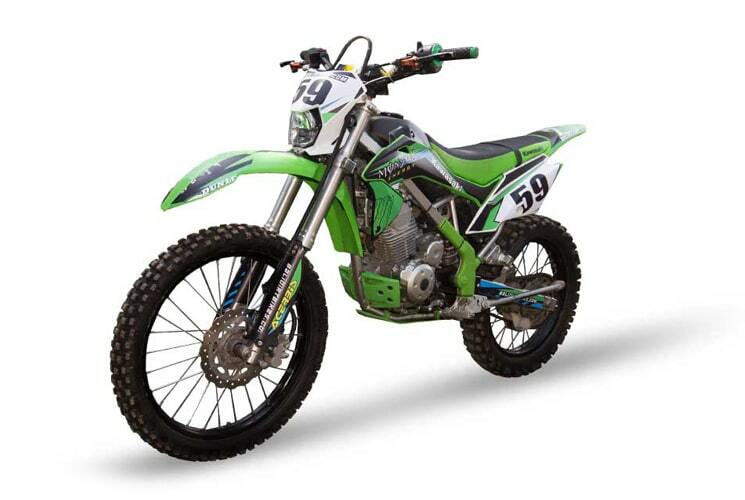 This trail will be driven with a beginner-friendly KAWASAKI KLX 150. We also will provide all the safety gear. This is included in your package price. And you can optionally rent a GoPro to capture all memorable moments of your Bali dirt bike adventures through the different terrains. It’s always fun to look back on the footage.